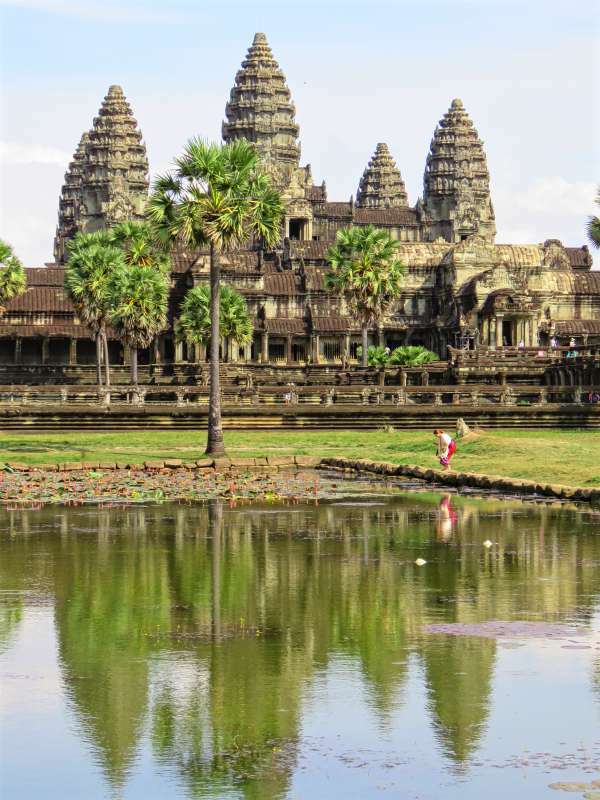 The Travelling Lindfields: Angkor Wat and the 7 must see temples of Angkor. "I suppose you have to visit Angkor Wat, but at the end of the day you are glad its over!" The problem with Angkor Wat is size. It is just massive. The building is spread across more than 200 hectares. You can spend hours and hours there and still come away with the feeling you missed bits. There is also an issue with expectations - always a problem for me with well-known tourist sites. My expectations of Angkor Wat were so high there was no chance the real thing could live up to them. Mostly though I was disappointed that the temple seems to be a never-ending labyrinth of corridors and passageways. There aren't any of the great halls or courtyards I associate with other religious buildings around the world. Up close Angkor Wat felt like a medieval maze which I never really got the hang of. 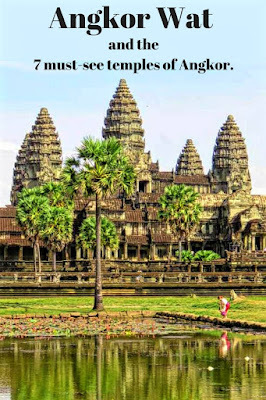 Does this mean you should skip Angkor Wat. No, absolutely not! Imagine coming home from Egypt and announcing you didn't visit the pyramids. 'Too much effort,' you could explain to relatives and friends just before they had you committed to the local loony bin. Do not skip Angkor Wat! Try to see it as a necessary prelude to all the magical temples you'll discover once you've got this one over with. Carry plenty of water. We visited in the 'cool' time of year and it was still almost unbearably hot and humid. You can purchase water at stalls across the road from the causeway entrance but it is a long walk back to them if you run out. Organise a guide to show you around. The sheer scale of Angkor Wat makes it difficult to explore on your own. The drivers are not permitted to act as guides. If you choose to visit the temple without a guide take careful note of where you will meet your driver when you leave. There will be tourists, drivers and guides everywhere and finding your guy will be a bit like chaos theory magnified a thousand fold. Angkor Wat is very popular at sunrise. However if you want a photo of the complex reflected in the moat go in the afternoon. Angkor Wat - my best reflection photo! Angkor Wat carvings. Our guide explained who the various figures were but it more or less went in one ear and out the other - ooopps! You may not have heard of Angkor Thom but like Angkor Wat, Angkor Thom is another not-to-be-missed attraction. Sadly, it suffers from much the same problem as Angkor Wat. Angkor Thom is on a massive scale and its sheer size makes it difficult to appreciate, let alone enjoy. 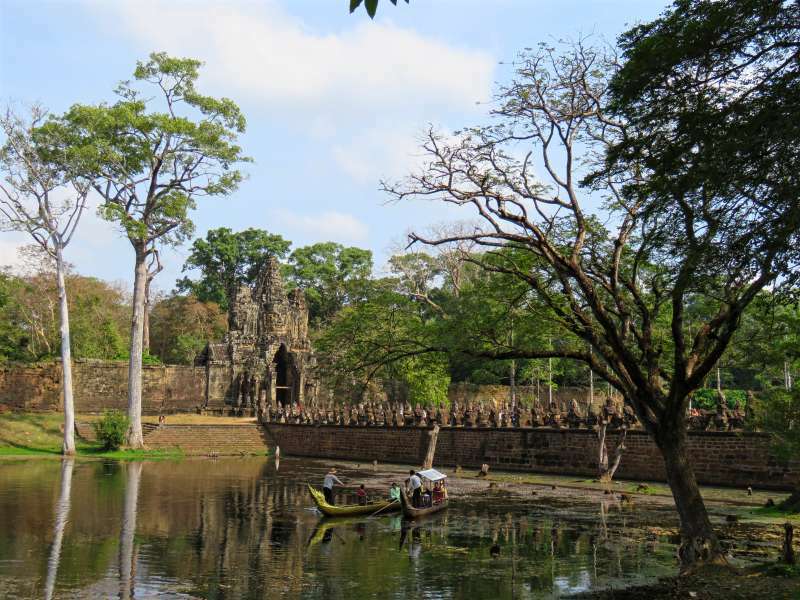 Angkor Thom was a city rather than a single temple. There are however several temples within the city walls the most significant of which, the Bayon, is right in the centre. 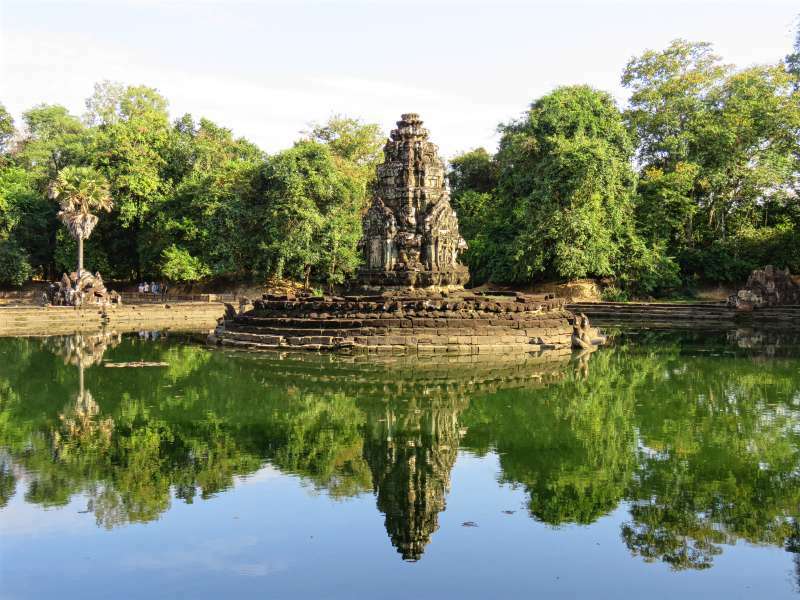 If you think Angkor Wat is huge, wait until you see Angkor Thom. The city was spread over an area of 10 square kilometres with 8 metre high walls which are 3 kilometres long on each side - and before someone tells me that is only 9 square kilometres, there is also a moat 100 metres wide which no doubt makes up the extra area. The city once housed a population of one million people. Now it is empty - just David, me and ten thousand other tourists! The east entrance through which we drove in to Angkor Thom is lined by statutes of gods and demons - 108 of them. Gods on one side, demons on the other as if facing off before a gigantic cosmic sporting match. Stop before the causeway and walk a few metres to the left for a great photo. This is another monument where, just because of its huge size, it helps to have a guide. My photo taken from the east gate of Angkor Thom. 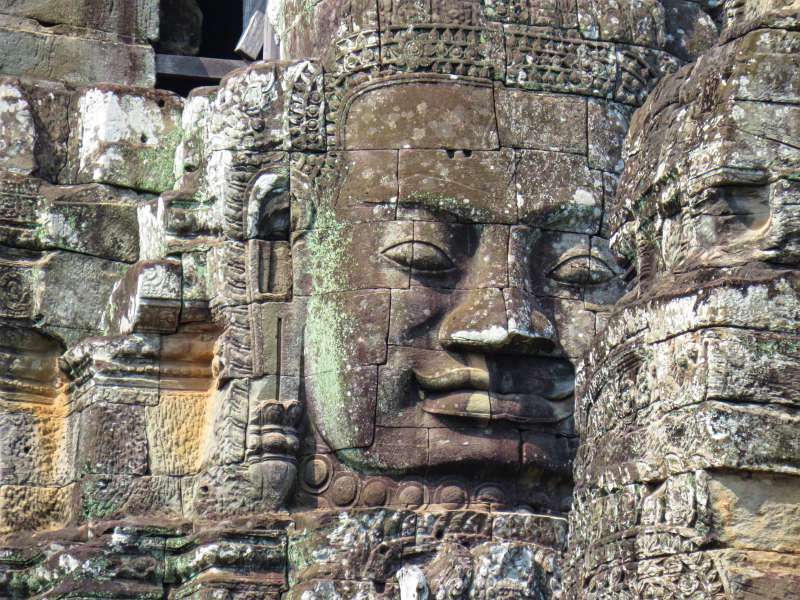 Faces are a theme at Angkor Thom. Have you seen the movie Tomb Raider? I haven't but, unlike David who lives under a rock, I have heard of it. Parts of the movie were filmed at Ta Prohm temple and today it is often referred to as the 'Tomb Raider' temple. Ta Prohm is billed as the temple left by archaeologists in its original state. Except for a few visitor paths the jungle is slowly reclaiming its own. Sadly the temple's Tomb Raider fame eclipsed any chance of us glimpsing the famed surreal atmosphere. It is hard to find romance and mystery in something packed with other tourists. There was one spot which had a long line of selfie-stick toting visitors each waiting patiently for a chance to photograph themselves in front of a wall covered in massive tree roots. 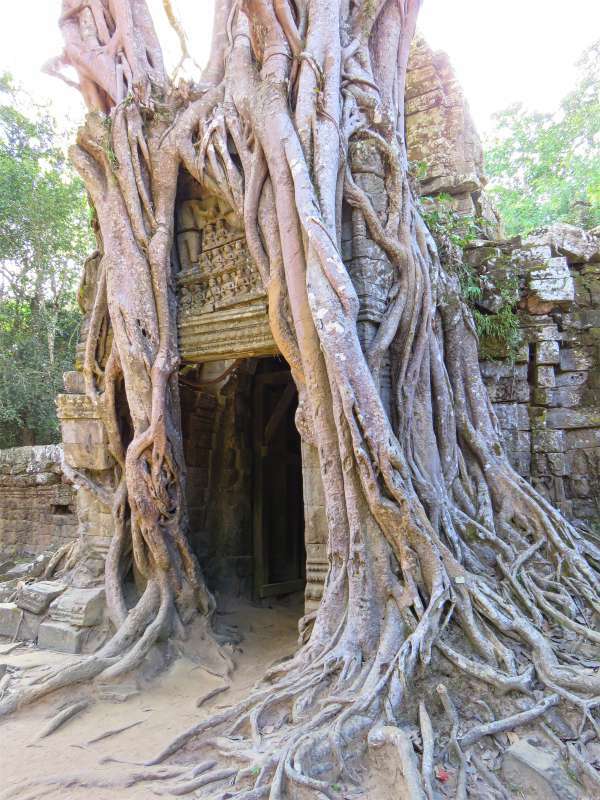 Don't think you can skip Ta Prohm either. This is another - 'What you couldn't be bothered seeing the pyramids?' temple. Just keep your expectations under control and add it to your 'must-see' itinerary. 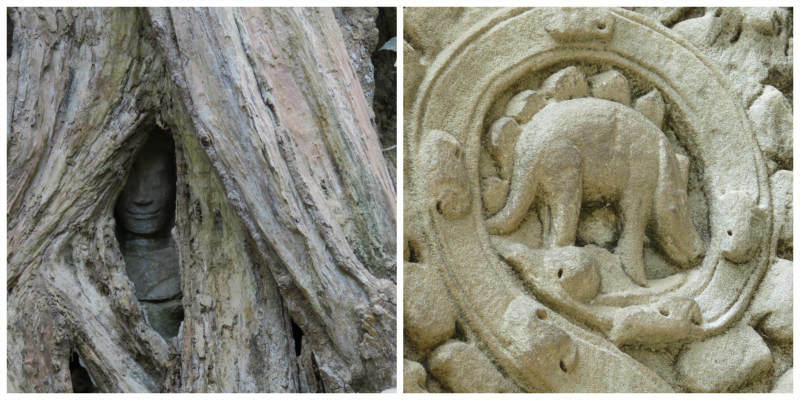 You don't need a guide for Ta Prohm unless you really want to go into detail. It is much smaller than Angkor Wat and Angkor Thom. Look out for the small girl's face sneaking out of the tree roots just past where everyone lines up for the Tomb Raider selfies. Don't miss the carving which looks like a stegosaurus. Is it a stegosaurus, or just a rhinoceros with a funny looking back? 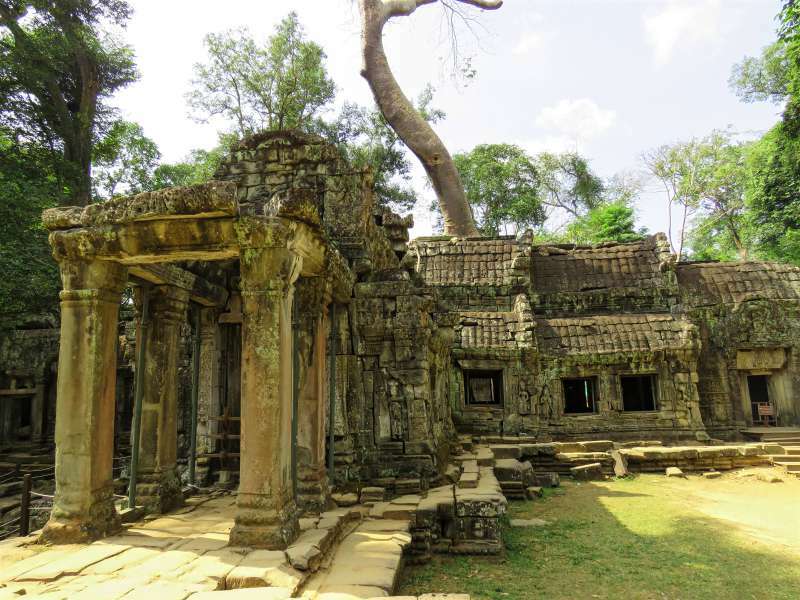 For a largely unrestored temple without the crowds of Ta Prohm head to Ta Som or Preah Khan. The 'Tomb Raider' photo op queue at Ta Prohm. The lady and the stegosaurus! 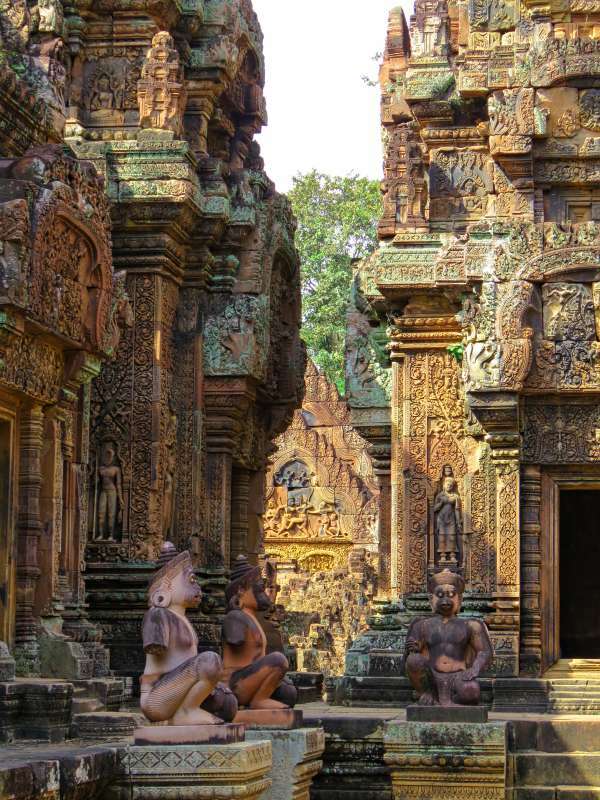 Banteay Srei, or the 'Citadel of Women' is said to feature some of the finest carvings in the world. It has been beautifully restored. Being much further from Siem Reap (38 kms) it doesn't get the crowds which more easily accessible temples get. There were still quite a few people around when we were there but we didn't feel quite like sardines in a tin in the way we did in parts of Angkor Wat. Combine your visit to Banteay Srei with Banteay Samre. They are both a bit out of the way but quite close to each other. 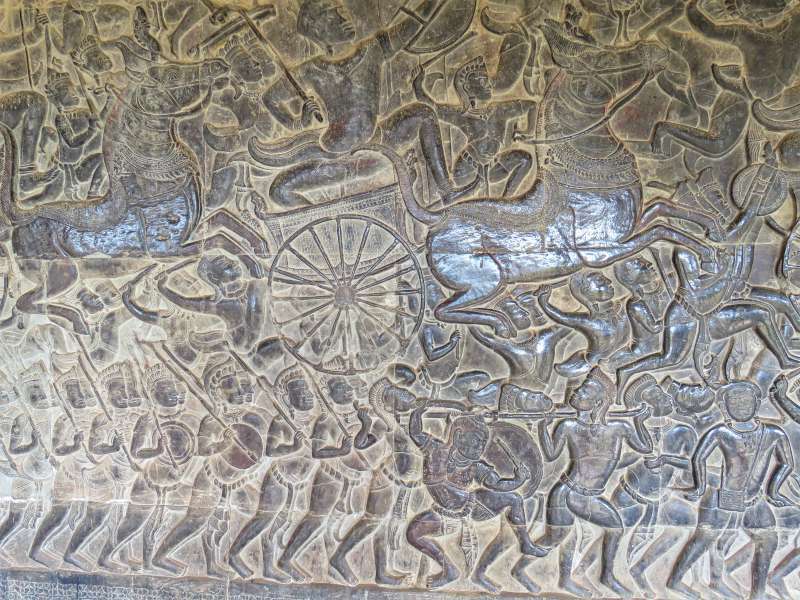 Some of the exquisite carvings of Banteay Sre. Banteay Samre was one of my favourites. We had the temple almost to ourselves. 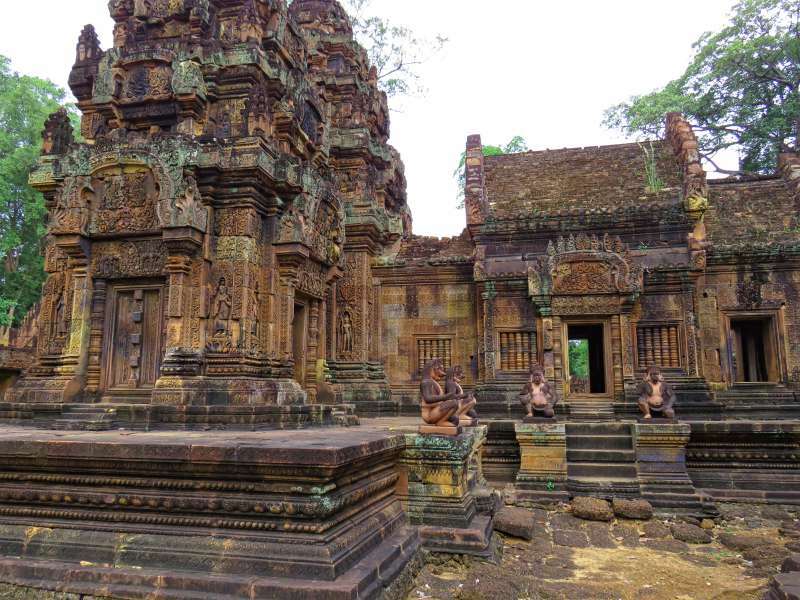 Banteay Samre is one of the most completely restored temples. The restoration of the temples uses a method called anastylosis which involves taking the whole structure apart and rebuilding it - no easy task given that 'structure' is used in the loosest sense of the word. Try to imagine a giant jigsaw puzzle with half the pieces lying around jumbled or damaged on the ground and the other half missing altogether. Many of the temples we saw had giant stone blocks scattered in unruly piles. They were numbered with white paint, waiting to be painstakingly re-assembled. The drive to Banteay Samre leads through local villages which are fun to stop at and explore. 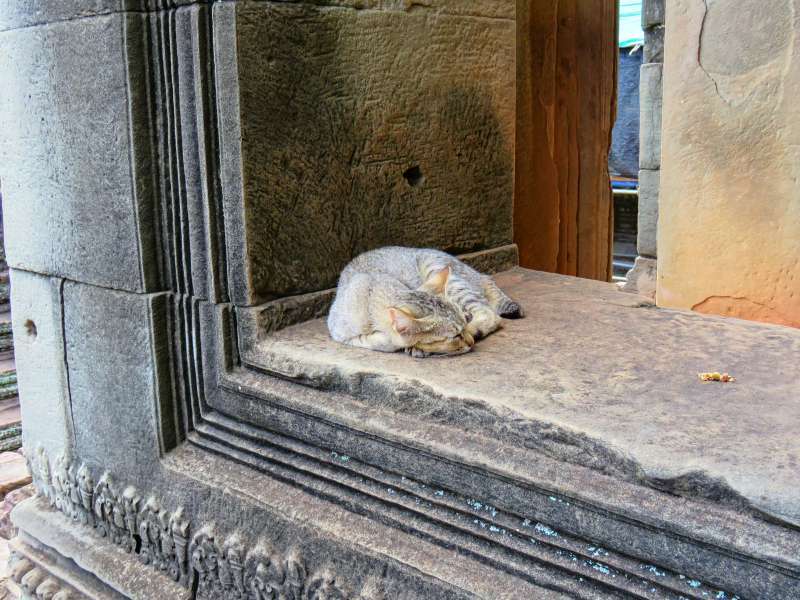 Except for this little guy we had Banteay Samre to ourselves. Ta Som is like a smaller version of Ta Prohm, the Tomb Raider temple, so if you want to see Ta Prohm without the crowds head to Ta Som instead. Take a couple of photos of the unrestored walls and tell your friends back home it was Ta Prohm - they will never know the difference. Don't miss the east entrance. It is on the far side from the car park so you have to walk around to the back of the temple. There we saw a magnificent ficus tree growing around, above and through the entrance - very much in the vanguard of the jungle reclaiming its sovereignty. More monument than temple, Neak Pean was one of my favourites even though it is much smaller than the other temples and you can't get right up to it. It stands in the centre of a pond on an island surrounded by flooded forest. To reach the island we crossed a long, hot causeway. I loved it and David declared it his least favourite. I was wearing a wide-brimmed hat and David had nothing to shade his head from the afternoon sun which may have had something to do with our poles-apart views on the temple. 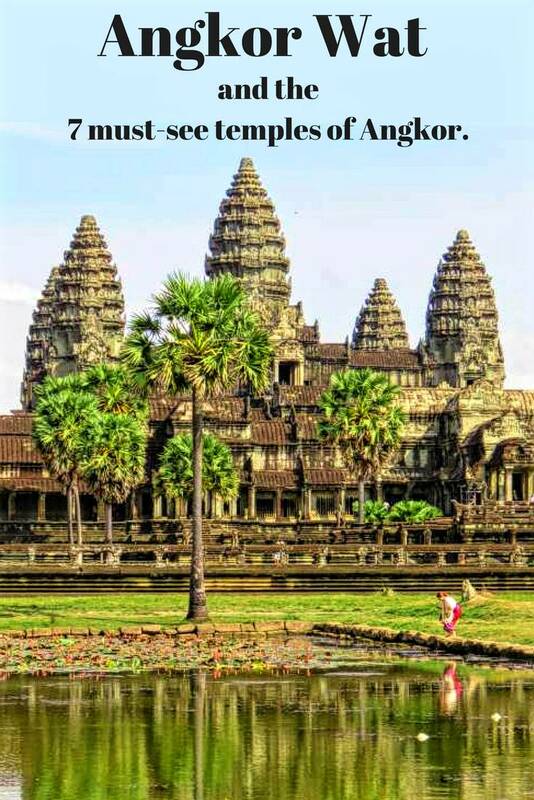 Have you been to the temples of Angkor? Do you think I have picked out the best seven? Which are your favourites? Such beautiful photography! I had no idea that Cambodia has so many temples! It's just made it onto my bucket list thanks to you! It is a wonderful destination. I can't believe it took us so long to go there. Hi, this is a great list with some temples which we didn't visit. We visited with our kids (5,2 at the time) so we had to find temples that had lots of exploring! We really loved Preah Khan and Beng Mealea. We loved the whole experience! Preah Khan was David's favourite. It is a great one to explore. It nearly made it on to my list but it was the last temple we went to and I think I was just exhausted by the time we saw it. I must confess that the Angkor temples were on my "avoid at all costs" list, as being too famous and too crowded. But having seen your pictures and descriptions, and your assurance that there are some lesser-visited temples in the area, I might be tempted to think again. The well-known temples are very crowded but there are so many less well-known ones it is a great place to visit. I would love to put my cat photo in your gallery. Thanks - I'll do it now. We just spent a full week around the Angkor Temples, an absolutely amazing place. We loved Ta Nei, small overgrown and more or less deserted. Oh no! We didn't see Ta Nei. Now we'll have to go back - lol! WOWSERS! I did not know that there are 1000 temples of relevance in Cambodia...I love that you've shared photo tips too, I am always keen to get the best shot possible. Blame it on the blogging I say! Thanks Lyn! Haha - I know what you mean when you say blame it on the blogging. I take hundreds more photos than I used to trying to get that perfect angle. I am looking forward to visiting it some time !.. I hope you get there one day. It is fabulous to see. What a fantastic summary! I visited the complex over three days as well about 10 years ago, but didn't have such a clear summary of it my head. Ta Prohm was my absolute favourite. There was no photographic enclosure back then, it was relatively empty first thing in the morning. It would have been less crowded ten years ago. I didn't mind the crowds though. Cambodia is a very poor country with such a tragic history I am happy for the locals to get as many tourist dollars as they can. I especially like your reflection photos and bringing enough water is a good tip. There is never enough time in Siem Reap is there. I loved Banteay Samre too! I think that and Banteay Srei were my favourites. We got up at 5am to drive there and pretty much missed the crowds so it is worth doing. You got some great photos and your list is a perfect guide for anyone planning a visit. I think it's really worth having a bit of an idea of what there is too see before you get there We stayed for 3 days and I didn't see Neak Pean. I found it quite confusing trying to figure out which temples to visit when we were planning the trip which is why I wrote this post. I also intend to publish a 'Tips on visiting the Angkor temples' but we are just about to head off to Mexico so it might be a while. I can't wait to return to Cambodia to visit the temples you have shown here. 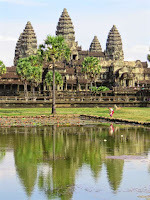 Great photos, I loved the faces of Angkor Thom, the carvings at Banteay Srei and of course the reflections at Angkor Wat. I appreciate your tip to go in the afternoon when I imagine their would be less crowds? Cambodia is a wonderful country to visit. I can see why you want to go back. Oh this is a lovely guide to the temples! There are so many! I wouldn't know where to begin, but this is definitely helpful! I also like that you included tips! Pinned for later! Thanks for linking up with #TheWeeklyPostcard! Thank you for your kind words. I hope my post helps a bit for anyone thinking of visiting Siem Reap and the temples of Angkor. I know so very little about Cambodia and Angkor Wat so I learned alot reading this. Very extensive coverage and helpful to know if I ever make it there - which hopefully I will. I avoided writing about Cambodia's modern history. It is a tragic story but I wanted to focus on the truly incredible temples. Absolutely beautiful photos. These carvings just blow my mind. They are so intricate and look so precise. Definitely saving this for another day since I don't have any plans to visit Angkor Wat anytime soon, but I definitely feel the need to so at some point! This gives me a great starting point to plan! The temples of Angkor are amazing, all the more so because they are hidden away in the jungle. I have not been to Angkor yet and the information you gave will definitely guide my eventual visit. I love your photos of the trees engulfing some of these great structures. You would love the photo opportunities. You could take some incredible images. I just loved Siem Reap - and not even for the temples. One of the best holidays we've ever had. Amazing palce. Three days was perfect. You could spend more because there are so many temples but they get a bit similar after a while so three days was enough. I wouldn't go for less time. Hmmm... so you beat me to Angkor Wat, Lyn. My only consolation is that now I'll be able to use your information when I visit these temples. Those tree trunks growing over those statues are fantastic. I've always wanted to visit Cambodia but still didn't make it there. Hopefully someday. Let me know when you are planning your trip. I'm happy to provide as much info as I am able. The temples are fabulous. You'll love them if you ever get there. Thanks so much for this information! It is so helpful. We are hoping to get here in the next few years. Trying to figure out when it fit it in. Pinned it for when the time comes. Do your research on what time of year to go. We went in January which is a fairly busy time but supposed to be cooler. I have long wanted to tick this off my bucket list. Well, you have just given me the shove. 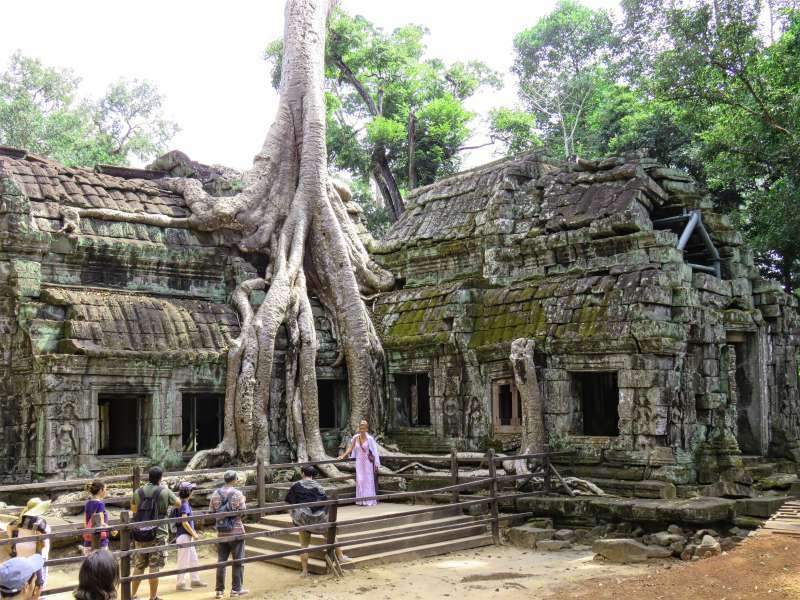 That means only 6 to see because I will go to Take Som instead of Ta Prohm. 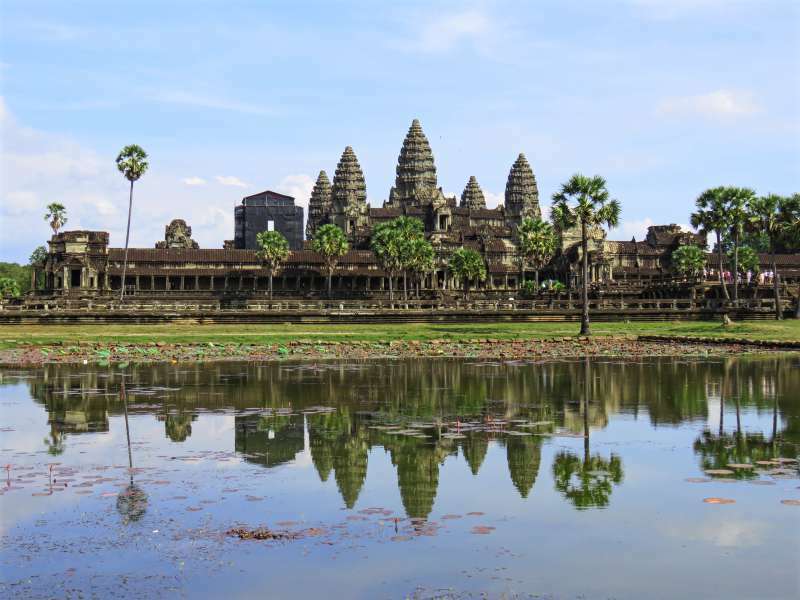 Do you have any suggestions on how to make manageable Angkor Wat and Angkor Thom? I think the best way to see Angkor Wat and Angkor Thom is to engage a local guide. Angkor Thom especially is so big you can't appreciate it without a bit of local knowledge. great tips. Pinned this as a reference for when I get a chance to visit. You will love it when you do. Siem Reap is becoming more and more popular. I would advise anyone to go sooner rather than later if they want to experience the local feel. We've just started talking about setting up a trip to Thailand and of course, I can't go that far without visiting Vietnam and especially Ankor Wat. You've got some great suggestions and I love how clearly you've laid them out. Keep an eye out for my next post. 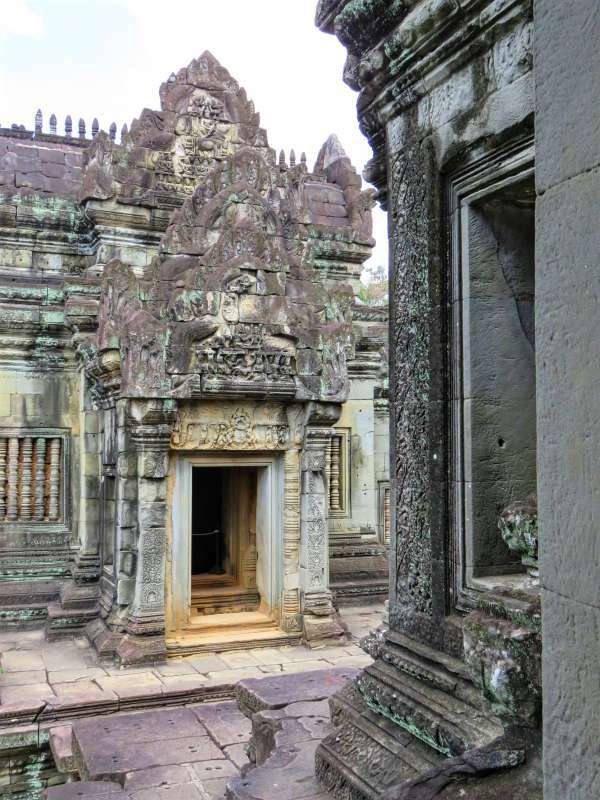 It will be on practical tips for visitors to Angkor Wat. I love historical places but never thought about Angkor Wat. Pictures are really beautiful and i would love to go there. Thanks for the information. Hi Stella, I hope you get there one day. It is an amazing place.